The USB Webcam 041 allows capturing videos directly in the Coach 6 program.The use of WebCam (041) under Windows XP (SP2 or higher) and Window Vista is supported without the need to install a driver (the drivers are built into the operating systems). Windows 2000 is only supported when the correct driver is installed. Download driver. 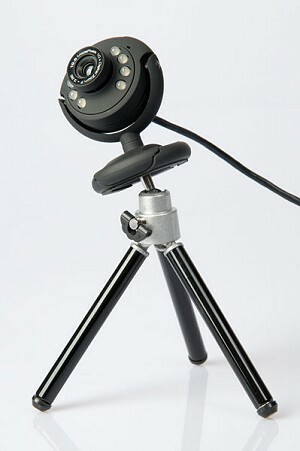 The webcam has a built-in microphone, built-in LED lighting and a tripod included. To use the microphone, the microphone plug must be connected to the microphone input of the computer. The LED lighting can be turned on or off by turning the wheel that can be found on the cable of the webcam. Focus can be adjusted by manually turning the focus ring around the lens. The webcam is able to capture up to 30 frames per second at VGA resolution (640 x 480), but capture speeds depend on the lighting (with poor lighting it will be lower) and may be affected by computer speed (for older machines). Technical specifications of the Webcam are described in its User's guide.